Swedish action-cinema has been a pretty obscure little genre. Action has always been looked down upon by so called "cinephiles" and critics. Whenever an action picture has been made, it was usually an attempt to copy american actionmovies in all its excesses without attempting to add a local Swedish contemporary flavor to it. 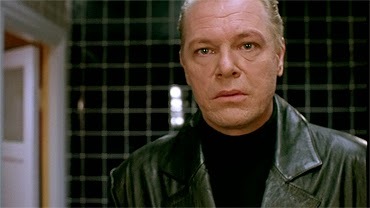 No wonder it has been laughed at, the attempts have been abysmal at best and embarrassing at worst, until Anders Nilsson´s Zero Tolerance was released.Now the laughing has stopped. Ironically, Nilsson was tutored by the Swedish exploitation filmmaker Mats Helge Olsson (The Ninja Mission) who put out the most generic (but still fun) "americanized" actionpictures that was laughed at. Nilsson learned the craft by directing dozens of ninjapictures which led up to his first mainstream film, which he co-wrote with Joakim Hansson. 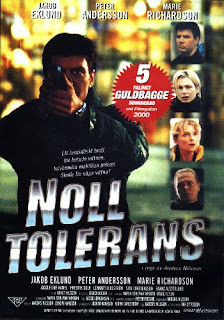 Zero Tolerance focuses on ex military Johan Falk,detective in the Gothenburg police force , a lone wolf who has some cooperation-issues with fellow officers, a typical cop action movie convention. 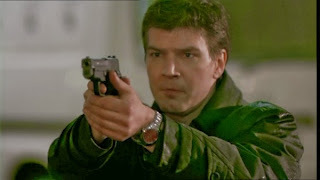 Like many great cop action pictures, it takes place during Christmastime (Die Hard, Lethal Weapon) and Falk (Jakob Eklund) stumbles upon a robbery, pursues the suspect which leads to a shootout leaving an innocent bystander victim for a stray bullet from the movie´s antagonist Leo Gaut (Peter Andersson). Three witnesses saw the whole incident and now Gaut is wanted for murder. However, Gaut uses an informant within the police to get the names and adresses from the victims to threaten them from testyfying, leaving the witnesses between a rock and a hard place, since inSweden, a person is by law forced to witness or jailtime might be the consequence. The witnesses refuse to point out Gaut, leaving Falk to take measures into his own hands, but soon he is framed for assaulting Gaut and Falk himself becomes a wanted man and alone need to find evidence of his innocence as well as going after Gaut. What makes Zero Tolerance so exciting is that as a genre piece grounds itself in a Swedish reality. The action is akin to Swedish film making sensibilities, unlike previous efforts. It is highly realistic and serves the plot of the film. Reminding you of great 70´s pictures like Bullitt or The French Connection. It might not be spectacular in terms of staging, but the suspense of the movie makes them thrilling to watch. Nilsson also exhibits a great sense of cinema by giving the audience visual cues or clues of what is going on in the story below the surface. Falk is a great mythic hero with a troubled past. He shares some similarities with Lethal Weapon´s Martin Riggs with his background, where his one true love getting killed in a carcrash. Howevere, Riggs wife was murdered, we never find out the circumstances of this tragic event that shaped Falk´s personality into the shutoff lone wolf he is, shutting everyone out. Zero Tolerance is the first in a long line of Johan Falk adventures. There were two also theatrically released sequels as well as an ongoing feature-length television series that consists of twelve (!) movies. I intend to review all of them, since these movies really need an international audience. While the themes might play better with a nordic or swedish audience, the mythic qualities of the hero and the story should appeal to a broader audience. The soundtrack to this series by Bengt Nilsson is incredible.